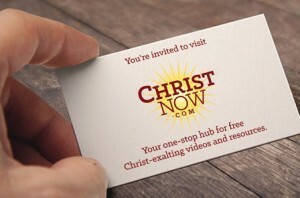 Thank you for your interest in ChristNow.com. We’re a one-stop hub for free Christ-exalting resources. Our goal is to expand your vision of who Jesus is right now. If you have a comment or question, we invite you to contact us. And, because ChristNow.com is “from the Church, for the Church,” we welcome your recommendations for additional free resources we might feature. Sign me up for the Christ Now blog? To financially support ChristNow.com with a tax-deductible gift, you can donate online. Learn about our email ministry options. We’d love for you to add to our resources.